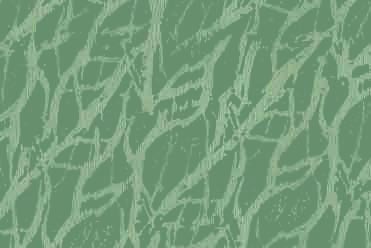 Map of Pinos Altos Cabins and Nightly Cottages, and of Grant County, New Mexico. Pinos Altos Cabins are nestled on a tree-shaded hillside at 7000 feet in the Pinos Altos Mountains. We're The Best Location — just outside of Silver City, New Mexico! Thanks for this great get away. Enjoyed the awesome views and the night sky. 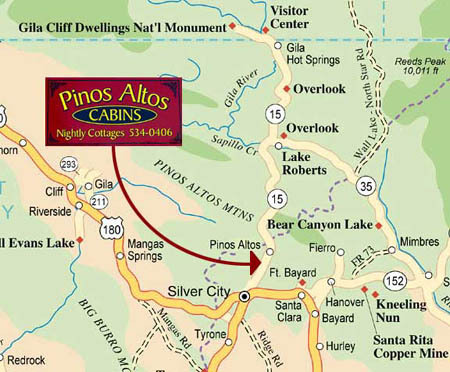 Pinos Altos Cabins are located on New Mexico Highway 15, also called Pinos Altos Road, just 1 mile downhill from the historic mining community of Pinos Altos. We're less than 6 miles from the intersection of NM 15 and Highway 180 in Silver City, making our cottages some of the easiest to find in the county. Our location on NM 15 puts you central to the most popular destinations in Grant County, including the world-famous Gila Cliff Dwellings and the 3.3-million-acre Gila National Forest. For a much larger map of the area, click here. All maps are © by Jan Underwood, Information Illustrated, 2005. All rights reserved, and used by permission of the Silver City- Grant County Chamber of Commerce.